Ex'cla-ma'tion is a perfume by Coty for women and was released in 1988. The scent is floral-fruity. The production was apparently discontinued. Face of the advertising campaign is Famke Janssen. I used to wear this in high school, and I revisited it today in Gordmans. It was never a favorite, and now I remember why: On my skin it is only a powdery, sweet peach. It approaches synthetic territory, which unfortunately happens a lot with peach, IMO. I have always liked the bottle, but I feel the name doesn't match the bottle or the scent. It's cheap enough to take it out for a test drive though, if you're fond of peaches. For such a quirky bottle and the promise of statement-making, this scent doesn't quite live up to the hype, BUT... that's not a bad thing, because it's still beautiful. It isn't at all loud, obtrusive or bold. Wow, did this perfume really come out of that exclamation point bottle? It's so soft, sweet and safe! Creamy vanilla, sweet peaches & apricots with just a little pinch of cinnamon. Wispy musk, soft & sandalwood and delicate rose.. it smells as if it could just float right away! Don't let the bottle fool you. This is a well composed and serious scent. I'm glad I snagged a bottle. "Modern Talking" and the late 1980's, disco-fox, blue eyeshadow, leggings and shoulder-pads - this fragrance reminds many people of their teenage-days and highschool. It wasn't available in Germany at the time, so I tried it in the early 90's in Russia (of all places!). A friend of mine had taken up a job as a representative of Coty fragrances in Moscow and he gave me about 5 different fragrances by the brand as a gift. 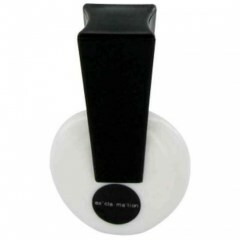 "Exclamation" seemed a very artificial scent, you could smell the cheap ingredients, but on the other hand it was clear that there was something to it, probably the expert nose of its creator Sophia Grojsman working on a very tight budget. Isn't it interesting to observe how fragrances reflect particular times, and isn't it amazing that "Exclamation" is still around - (at least online) ? Which are the perfumes worn by today's highschool students? Still the notorious fruity-florals, if you ask me. 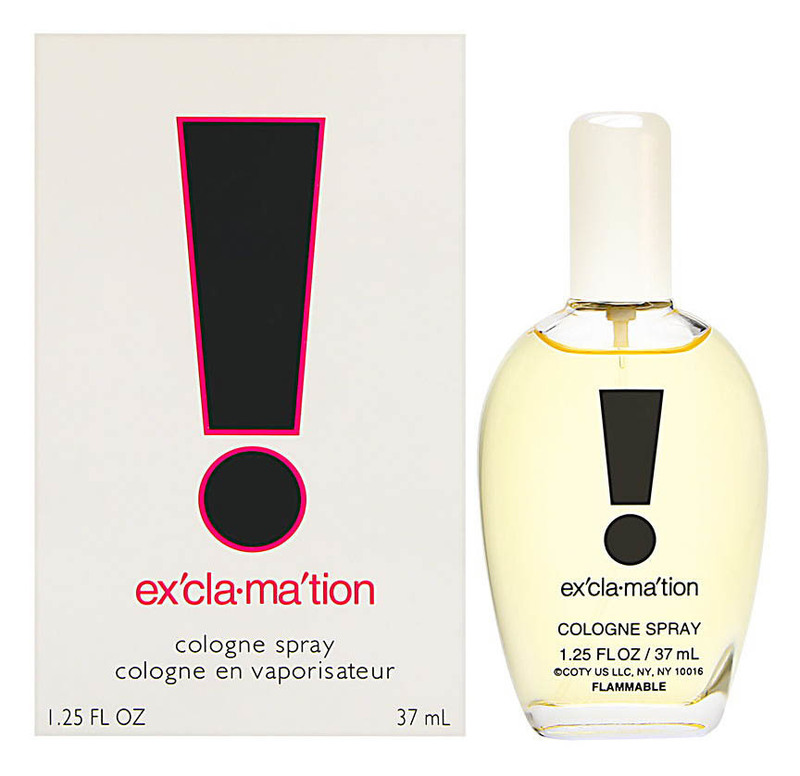 Compared to the average drugstore fruity-floral of 2014, "Exclamation" seems like a scent from a different scent planet. It's a loud and synthetic fragrance, but at least it does not lack personality. I purchased this on a whim at the drugstore for nostalgia's sake. (Hello 1990!) Soft musk, creamy sandalwood, warm fleshy fruits, and sweet spice from the cinnamon. Cozy, comforting, and completely unpretentious. The scent is obviously linear and simple, so to bring it a little more personality, I like to wear it on my wrists with a spray of Burberry for Women on my neck/chest after bathing with Vanilla & Sandalwood soap. Sometimes I'll even add a little Kuumba Made Amber & Sandalwood oil on the back of my neck. Ex`cla-ma`tion does sort of resemble Vanilla Coke or Dr Pepper when first sprayed. That's not a negative to me, however. It smells delicious! This was my very first perfume, the first one I bought myself, much too brash and penetrating, rather violent really. It is dominated by a very sweet rose, which seems to be a trademark of Sophia Grojsman's. I find that I have rather a lot of her compositions. She became more subtle, but seems to have retained a preference for sweet and rosy flavours. When I came home and proudly showed off with it, my appalled parents took me out to buy a "real" perfume, because they thought this one cheap and importunate. I picked Eau de Givenchy - very much opposed to Ex'cla-ma'tion in its unobtrusive classical beauty and which I still use through all those years.